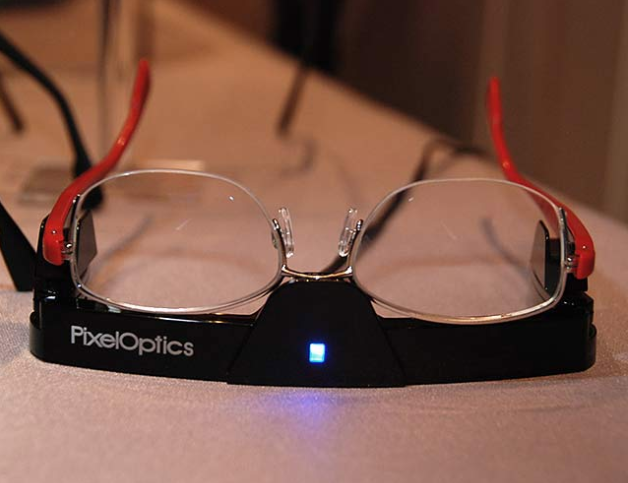 A company called, Pixel Optics has developed glasses which change focus when you look near or far. The device consists mainly of an accelerometer & lenses which are covered with transparent liquid crystals. When you tilt your head for near work, the accelerometer detects it and the liquid crystals change the focus of the lenses for near vision. When you look far, again the change is detected by the accelerometer & lenses are adopted for looking far in a fraction of second. These glasses are a blessing for the persons who are annoyed of the line in the field of vision, separating the lenses in bifocal glasses. The downside is that the device is currently expensive & costs around $1200. The other thing is that you have to carry its holder for charging & each full time charge lasts for around 3 days. But I like the idea of using Accelerometer, which have become common in todays smartphones & expect the device to become cheaper in future.